Someone once said that all of life is a conversation. I agree. Often the conversation is in our own heads where the dialogue never seems to end. Sometimes the conversation is between intimate partners or parents and children. Conversations go on in organizations all the time between leaders and followers, teammates, sales teams and customers, one department with another...and on and on the talking goes. Since this seems to be a de facto reality, it would behoove all of us to be capable of having world class conversations. So much time, energy and opportunity are missed because we’re having suboptimal discussions. I developed this chart years ago when I was spending a great deal of time working with financial firms, especially with asset managers. Research had come forward to prove that teams outperformed individuals, even and especially star performers. But for teams to outperform, one thing they needed to have was great communication. What I observed was that teams achieved great communication when they became masterful at candor and curiosity. In organizations where both candor and curiosity are low, the conversations will be either filled with drama or there’s no communication at all. This dysfunction usually exists where there is tremendous mistrust. Cumulative trust ruptures that go unrepaired lead to poor or absent communication. Like the couple who simply has nothing to talk about except the trivialities of life because the trust bank is zeroed out, teams can end up in the same place if they aren’t committed to restoring trust when it breaks down. This is what I saw in many large bureaucratic organizations or teams that valued civility and politeness over healthy conflict. In some cases these organizations were known to have great cultures where people stayed forever. But my experience was that they had very little edge and felt flabby as they allowed themselves to slide into complacency. They lacked the energy and capacity to challenge one other and themselves. In the extreme, this scenario feels more like a food fight than a winning team; there's lots of heat and not much light. One such organization I advised had the view that if you don’t fight for what you want you won’t get what you want. In these organizations “conviction” was what was most valued. What this looked like was arguing passionately for one’s point of view. Those with the most conviction were seen as the A players, even though they were horrible listeners and even worse learners. Over time these cultures get taken over by bully personas and alpha animals. One great loss is that the brilliance of introverts is lost because their communication style is not perceived to be blunt and forthcoming enough. These organizations can burn bright for awhile, but they usually burn out because sustainability becomes an issue. These cultures are best in class in my book. They take root in organizations that value speaking and listening in a way that encourages vibrant and meaningful dialogue. Competitive debate characterizes these cultures. Everyone says everything they have to say. They are fully revealed, including all thoughts, feelings, judgments, opinions, beliefs, wants and desires. Nothing relevant is ever held back. Fact is always differentiated from story and all stories are held lightly. I might have a preference for my story being a representation of reality, but I don’t believe I’m right. I believe I see the world a certain way and I know that I distort reality. Just like we all do. I reveal my truth in such a way that invites curiosity on the part of the listener, rather than defensiveness. I reveal with vulnerability, authenticity and humility. The highest priorities in the conversation are learning, growing, waking up and becoming the highest version of myself and ourselves I/we can be. Learning is always valued over proving I’m right. Deeply listening to others matters. I listen from all three centers: head, heart, and gut. I seek to understand you at all three levels: your content, emotions, and deepest desires. The question I ask as you reveal yourself is, “How is this true?” Not “Is it true?” “Is it true” puts me into an evaluative mindset. “How is it true?” puts me into a learning and collaborative mindset. At times I might not be able to see how your perspective is true, but my first priority is to ask how, not if. The context for these conscious conversations is that they occur from above the line. When I/we go below the line, we acknowledge it, accept it and shift back to deep curiosity. Approval, control and security are sourced from the inside, not from my colleagues, clients or leaders. From this place of deep self-awareness and personal maturity I’m able to have conversations that are truly and multi-dimensionally win/win. What I’m pointing to is that conscious, world class conversations are achievable, but not natural. We learn through committed diligent practice and a deep willingness to grow in consciousness, to wake up to what is. The Conscious Leadership Group stands for these kinds of conversations becoming the new norm for individuals, partners, and organizations world wide. Will you join us? Several readers of the above Going Deeper commented that the diagram and the description were not clear. Thank you. I take 100% responsibility for that. For those of you who would like more clarity, read on and for those of you who thought it was great as it was, enjoy it as you understood it. 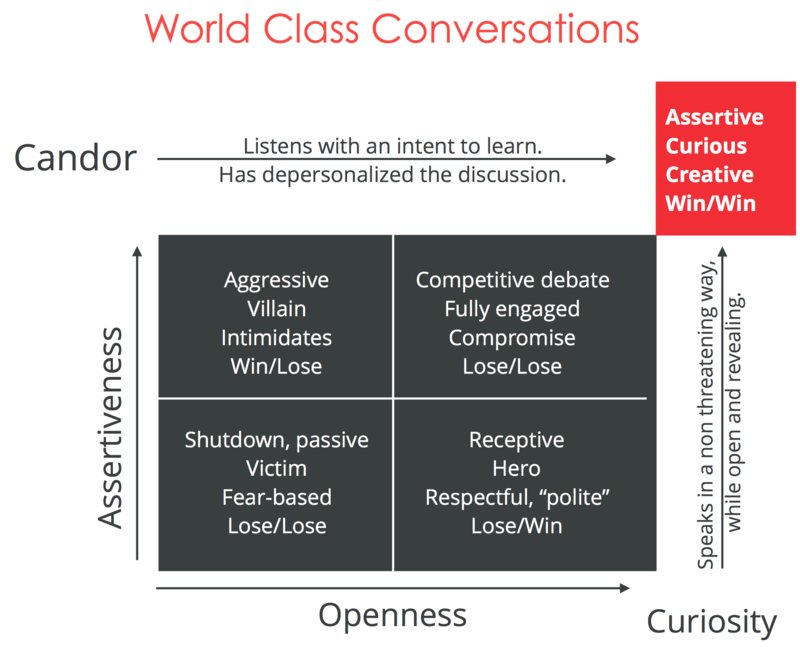 Assertiveness (Y axis) is not the same thing as candor. Assertiveness answers the question, how strongly do I hold and put forth my thoughts and opinions. It’s actually possible to be quite assertive and not very candid. This is what I saw in firms that valued “conviction.” Candor, on the other hand, answers the question, how authentically revealed am I? Candor is a combination of truthful, open (revealed, transparent, authentic) and self aware. Openness (X axis) is not the same thing as curiosity. This is particularly confusing as we often use the words curious, open and committed to learning as descriptors for being above the line. In this model openness is a synonym for receptive or willing to listen, hear, acknowledge another’s point of view. It’s limitation is that one can be open (including polite, respectful, even nice) without being curious. Curiosity includes a deep commitment to learning and a full on willingness to see how the opposite of all my stories could be as true as my stories. For this reason the box in the upper right hand corner is meant to represent something not only beyond (in degree) but actually different (in kind) than just conversations where people speak with conviction and listen respectfully. Such a conversation is actually a radically different thing. Finally, and possibly most confusing, the diagram says that Box #4 is “lose/lose” and in the description I called it “win/win.” Ooops, mistake made. The diagram is correct. Then the question is, “How is Box #4 lose/lose?” The answer is that whenever we settle for compromise vs. going all the way to win for all we are creating a lose/lose outcome. In compromise we are playing a zero sum game and based in scarcity and everyone is getting less than what they want (e.g. losing) where as, in win for all, a radically different way of engaging life and others, we are having the conversation from enough and even abundance and the possibility exists for win/win. The pathway to this radical conversation is through the descriptions listed for candor and curiosity. So, my desire is that this clarifies and answers the questions several of you had and, if not, I’m happy to keep the conversation going. All conversation is an opportunity for me/us to practice.